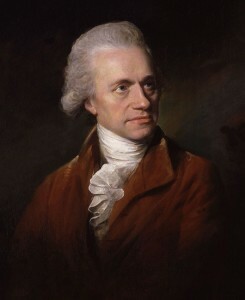 Herschel was born Friedrich Wilhelm Herschel on November 15, 1738, in Hanover, Germany. Following in his father’s footsteps, he became an army musician. Upon the French occupation of Hanover in 1757, he fled to Bath, England, where he developed a reputation as a music teacher, performer, and composer. He studied a book on harmonics by a professor of astronomy at Cambridge; he liked the book so much that he read the author’s book on optics, which led to his interest in telescope construction and astronomical observation. He was dissatisfied with the quality of existing telescopes and was able to achieve better resolution by grinding larger mirrors and fabricating improved eyepieces. In 1781 Herschel’s first significant discovery, the planet Uranus, resulted in his appointment as court astronomer to King George III. This provided him and his sister, CAROLINE HERSCHEL, who had joined him in 1772, with sufficient funds to pursue astronomy exclusively. He soon spotted two unknown satellites of Uranus and two of Saturn. The high magnification of Herschel’s telescopes led to a series of astral discoveries. In 1784 he resolved nebulae (milky splotches in the sky), which had until then defied explanation, into individual stars. Herschel concluded that all nebulae are clusters of many stars, a theory he had to modify in 1790 when he observed a nebula that consisted of a single star surrounded by what appeared to be luminous fluid. Nebulae that contain many stars are now known as galaxies. In 1789 Herschel and his sister completed construction of their largest telescope; it had a diameter of 122 centimeters and a focal length of 12 meters. He catalogued more than 2,000 nebulae and 800 two­star systems. In 1800 he was the first to detect infrared radiation. Tracking relative positions of stars across time, he produced calculations of the direction and velocity of the solar system through space. Some invalid theories emerged from his research, such as the idea that all stars have the same brightness and that differences in appearance are attributable only to varying distance from Earth. He also incorrectly assumed that all star clusters inevitably condense into more tightly packed star clusters. But he was the first to find evidence that the Sun is moving in space and that stars are not distributed evenly but are arranged in a huge elongated disk (as with the Milky Way galaxy). These were novel conclusions that were upheld, with minor modifications, after his death. Herschel died in Slough, England, on August 25, 1822. With his sister’s assistance, Herschel added thousands of elements to the astronomical record, establishing the importance of high ­magnification equipment and tireless observation of the night sky. Herschel’s conclusions concerning the movement of the Sun and the shape of the stellar system in which it lies formed the basis for further discoveries about the structure of stellar systems in general. By the 1830s instrumentation had become sophisticated enough to measure interstellar distances; in 1904 measuring distances with the use of statistical methodology helped Jacobus Kapteyn to conclude that stars in the Milky Way stream in opposite directions and that the shape of the stellar system is elliptical. In 1923 EDWIN HUBBLE showed that the “nebula” called Andromeda was actually a galaxy beyond our own Milky Way. The telescopes the Herschels built, with their increased powers of magnification, helped succeeding generations of astronomers. Incremental improvements in telescopy gradually augmented astronomical observers’ abilities to learn more about the solar system, our galaxy, and galaxies beyond. Herschel’s legacy is also reflected in the work of his son John, who explored a wide range of scientific pursuits. He experimented with polarized light, constructed a geomagnetic survey of the Antarctic, and performed important research in chemistry that contributed to the development of photography. From 1834 to 1839 he lived at the southern tip of South Africa and mapped most of the stars in the southern sky.